We all wish sometimes that we could go back and change the past. But even if we could travel back in time, doing so would get awkward really quickly. Suddenly there’s the original you, the you that came back to change something, the other you that came back to stop you from making that change, the six mates your assorted yous brought with them and you really can’t avoid a fight. And then you really, really hope that the guy you just clocked with a tire iron is a past version of you and not a future one, so you’d have that punch to look forward to. And that’s before you consider paradoxes. It’s all very impractical. Fortunately for everyone involved, the T.I.M.E. Agency has come up with a better way to go back in time. Instead of physically sending you back they inject your mind into an inconsequential bystander in order to save the timeline from disastrous manipulation. And if at first you don’t succeed, they send you again, right back to the start, with your memories of what went wrong the first time. T.I.M.E. Stories is pretty light on the mechanics. Players explore a place of which they have a map right from the start. There are a number of locations in that place and the players always enter one of them as a group. When they do, they find the cards in the deck to lay out the panorama for that location, a long image of the location spanning a number of cards. 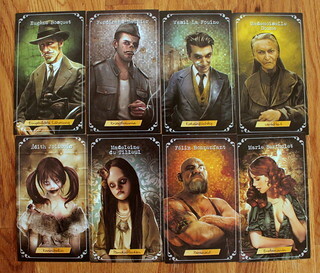 Then each player pick one of those cards to examine. Here they can split and team up any way they like. Players examining a card may turn it over and read the text on the back. Some are really just descriptive with lots of flavor, but others bring the actions. Some make you roll skill checks, others just want you to make a decision and some just hand you information you may or may not need later. You may acquire items to use later in your adventure, or you may turn over hidden cards from the current location to further the plot. As an example that is not from the case, you may examine a wardrobe. On turning the card you see that you may attempt a dexterity check to pick the lock. After you succeed you’ll be allowed to turn a hidden card from the location and discover what’s inside. Rolling checks, examining things and walking from one location to the next all cost you time, and that’s a limited resource. When you run out of time you are transferred back to the headquarters, your mission failed, the game is over. You may try again in a new game.Time being limited as it is, here’s one piece of advice I can give you without spoiling the experience for you: the instinct to explore every last corner that you may have acquired in video games and RPGs is not helpful here, if you have a way to complete the mission go for it. 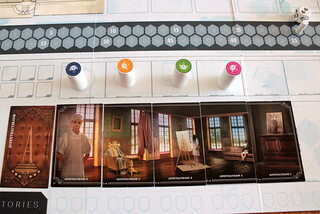 And that’s pretty much everything you need to know about the rules already, but a lot remains to be said about the scenario included with the game: Asylum. This is once again a game where I can’t tell you too much because of spoilers, but here is what I can tell you: the case takes you into an early 20th century insane asylum where, in some way, the future is at risk. You slip into the bodies of some of the inmates and get to work saving the world. I obviously can’t tell you what happens, but the story is dense and thrilling, a narrative experience that gets close to a role playing game. The art does a great job invoking the atmosphere and the ever-ticking clock gives you a strong sense of urgency. But all that doesn’t change the basic fact that there is a limited amount of time you can spend with T.I.M.E. Stories, and if you don’t factor it the expansions then it’s much less time than Pandemic Legacy, for instance. You have to ask yourself it it’s worth spending money on. On the one hand you only have a few hours of fun with each scenario. On the other hand, unlike the Legacy games, you can share a copy with friends and they can have fun with it as well. After trying it, what makes the decision for me is this: T.I.M.E. Stories is maybe the most immersive board game I have ever tried. That obviously depends on the scenario, but the Asylum really drew me in and made me feel like I was there, it was a great experience. And voices on the Internet say that The Marcy Case, another scenario that is already available, is even better. T.I.M.E. Stories seems like an attempt to create a subscription type model for boardgames. As long as you keep paying, you can keep enjoying it. After the first case I’m completely hooked. Consider me subscribed. In 2050, running a global enterprise isn’t an easy job. Profit is still the top priority, of course, but because of government regulation and consumer behavior, you can no longer ignore sustainability issues. You either take care of the environment, of your employees and of society as a whole, or all the profits in the world won’t save your company. Balance between those concerns is not always easy, but if you run your company well it’s possible. The Witch of Salem is one of many board games set in Lovecraft’s Cthulhu Mythos, and its art really makes that world come to life. Four scholars of the paranormal set out to keep the Great Old Ones imprisoned in R’lyeh. Will they succeed? The date is December 8 2127, and for exactly a year and a day, Earth has been at war. They came from deep space, no one is sure what their plans with Earth are. But we know one thing: those plans don’t involve us. i9n, or "Information" is a deduction game that uses punch cards to give new, hidden information during the game. It also adds some strategy and a bit of luck to the mix, making it a very fun game that certainly won’t be the last one to employ this new mechanic.